Ninja Burger is a parody website started in late 1999, purporting that a sect of noble ninja have taken to secretly delivering fast food meals, anywhere, anytime, within 30 minutes or less. Failure to deliver within the ascribed time limit results in Seppuku. Ninja Burger became well known after appearing on and becoming an affiliate of Fark.com, and soon after it was turned into a role-playing game. The site has also spawned a series of comic strips, several short films, a second role-playing game, a card game, a multimedia CD and a book. The second RPG is the subject of this page. The Ninja Burger 2nd Edition RPG, which uses the PDQ engine, was published as a PDF in March of 2006, and has been available in print since August, 2006 (ISBN 0-97931-960-9). 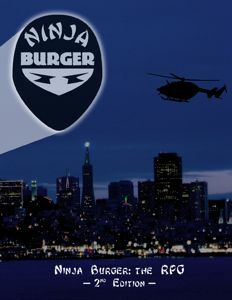 The game features a campaign set in San Francisco, California, which is (according to the backstory) the home of Ninja Burger Headquarters. Unlike the original game, it allows players to take on specific roles within the organization — such as chef, driver, etc. — in addition to the baseline role of "ninja". It also greatly expands upon the scope and scale of the original setting; whereas the 9th Level Games' game was designed for 30-minute game sessions where just about everyone died at the end, the 2nd Edition is designed for longer campaigns that allow characters to grow and develop as they normally would in any RPG. Ninja Burger is sold through Indie Press Revolution, Key20, Steve Jackson Games' e23 and Warehouse 23, YourGamesNow, and OneBookshelf (RPGNow/DriveThruRPG). It is available in PDF, Print-on-Demand and Print formats. Ninja Burger 2nd Edition (NB) is a humor RPG using the PDQ System.